The LV269 is a continuously variable low voltage, medium current power supply unit with 0-13V AC and 0-17V DC output. It is ideal for many educational and industrial laboratory uses. 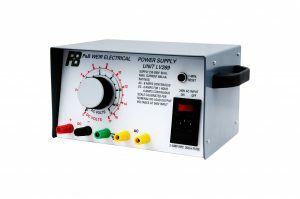 The power supply is continuously variable for both AC and DC ranges and is calibrated for nominal input of 240V 50 Hz. The maximum output from the unit on AC is 8 Amps at 11 Volts and on DC is 6 Amps at 11.6 Volts, continuous, or 8 Amps at 10 Volts for 1 hour rating. The AC and DC outputs may be used simultaneously up to a maximum of 8 Amps (the outputs must not be interconnected externally). The front panel carries calibrated AC and DC scales, with a central voltage control knob and single pointer. This control is equipped with a locking device designed to limit the maximum voltage setting of the unit, thus preventing accidental damage to equipment connected to the unit. The front panel is also fitted with captive head terminals which are colour coded Red and Black for DC supply, yellow for AC supply and Green for earth connection. The lightweight rigid construction houses generously rated components comprising: variable voltage transformer, low voltage transformer, full wave rectifier and smoothing capacitor. Tamper-proof fasteners are employed throughout.